100% up to $500 AUD. This welcome bonus is automatically applied to all first deposits up to five hundred Australian dollars. 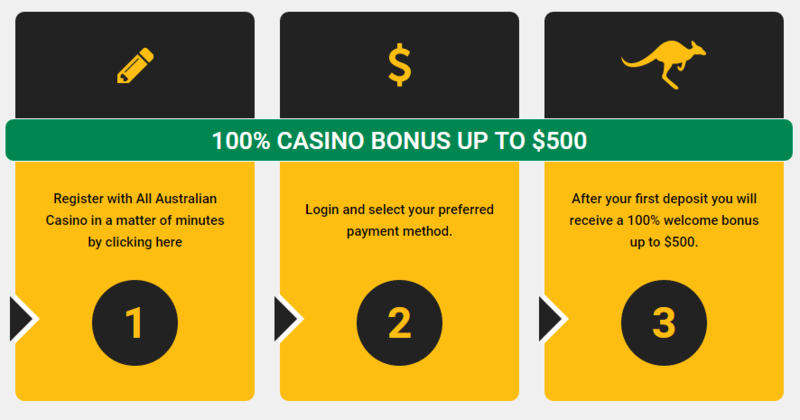 All Australian Casino offers the welcome bonus as an incentive for members of the Australian public to sign up and become members at the casino. All Australian Casino impose a wagering requirement on the welcome bonus of 35 times the bonus amount. For deposit/reload bonuses, login bonuses and manual bonuses offered by All Australian Casino Terms and conditions apply. The minimum deposit to receive a deposit/reload bonus is set at $ 10 AUD. Players from Australia who play at All Australian Casino will qualify for our welcome bonus and any other bonus offer. Players from countries outside Australia will not automatically receive bonuses offered by All Australian Casino. Any player who receives a promotional offer directly from All Australian Casino is entitled to receive the promotional offer. For all regular bonuses offered by All Australian the wagering requirements are 35x the received bonus unless specified otherwise. For players who have a bonus active on their account it is very important that wagering requirements are met. If the wagering requirements are not met players are not able to request a withdrawal or transfer funds to the live casino. When they do the bonus will be forfeit. A warning will appear to prevent players from losing their bonus. All Australian Casino bonuses are valid for thirty days to meet the wagering requirements. The following games count towards 100% to meet the wagering requirements: Classic pokies, pokies, lottery and other games. Table games and video poker games do not count towards the wagering requirements. Any player received a bonus is able to make a deposit to meet the wagering requirements. Bonuses at All Australian Casino are not valid in the Live Casino. A restriction is in place that only one casino account is allowed per person, family, address, household, email address, credit card number or where an IP address is shared (University, office, public library etc.) These restrictions are in place to ensure the welcome bonus is awarded only once. The All Australian Casino bonuses are not available to: employees of the company, volunteers, board members, freelancers, promotional, marketing, or other offices, issuers of licenses, license holders, issuers of licenses, service providers and any other detached or associated companies. The family members of all of the above people are also not applicable for the bonus. All people that are found to be in abuse of the welcome bonus and any of its terms and conditions will be excluded from this bonus and any other promotions ran by All Australian Casino. All Australian Casino have the right at any time to change the welcome bonus or any other promotion without reason or notification. Clients reserve the right to at any time choose not to accept a bonus. Clients wishing to do this can do so easily by logging into their account and selecting the correct box on their profile. All Australian Casino’s customer service team is on hand to help clients with this process if so needed. 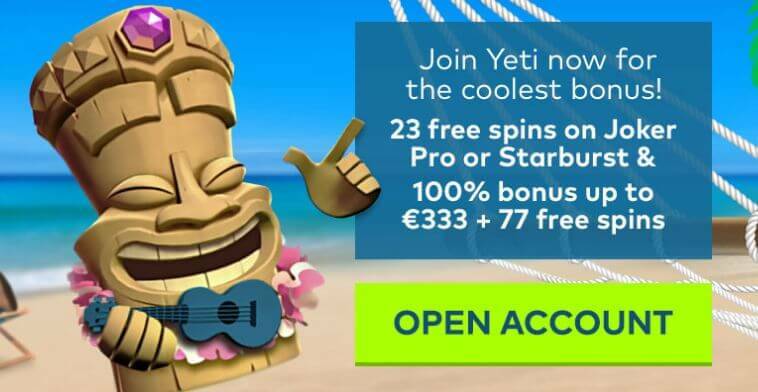 Registered players who have never deposited before activating a No Deposit Bonus and want to withdraw winnings gained by this No Deposit Bonus need to withdrawal a minimum amount of 40 AUD. Registered players who have never deposited before activating a No Deposit Bonus and want to withdraw winnings gained by this No Deposit Bonus are able to withdrawal a maximum amount of 100 AUD. Any bonus and winnings will be forfeited if a player has an active bonus and moves after winning from low weighted games like table games, to high weighted games like slots (or first bets high and then low with a stake not in proportion to the balance) for the sole purpose of completing wagering requirements. This will be judged at the sole discretion of the casino after reviewing the gameplay. 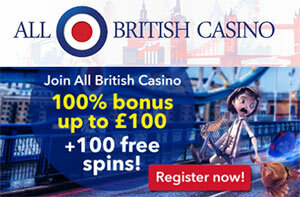 When received a bonus or bonus as result from free spins the maximum allowed bet is $5. Any bonus and winnings will be forfeited at the sole discretion of the casino after reviewing the gameplay. Certain partners of All Australian Casino offer an exclusive welcome bonus where the wagering requirements might differ from the generic welcome bonus of All Australian Casino.